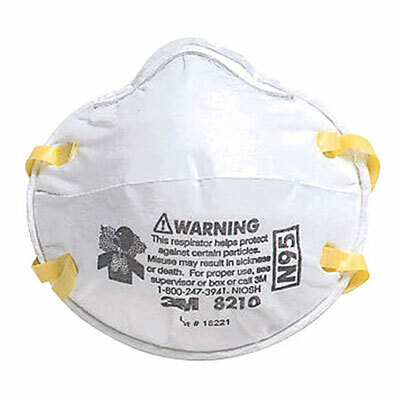 The 3M Occupational N95 Particulate Respirator is a disposable particulate respirator that is designed to help provide reliable respiratory protection of at least 95 percent filtration efficiency against certain non-oil based particles. This respirator is designed for use for particles such as those from grinding, sanding, sweeping, sawing, bagging, or other dusty operations. This respirator can also help reduce inhalation exposures to certain airborne biological particles (examples: mold, Bacillus anthracis, Mycobacterium tuberculosis), but cannot eliminate the risk of contracting infection, illness, or disease. The respirator incorporates 3M’s proprietary technology with advanced electrostatically charged microfiber filter media designed for ease of breathing. This respirator is compatible with a variety of protective eyewear and hearing protection. For more information on the 3M Occupational N95 Particulate Respirator, please visit www.3m.com. 3M is a global innovation company that never stops inventing. Over the years, our innovations have improved daily life for hundreds of millions of people all over the world. We have made driving at night easier, made buildings safer, and made consumer electronics lighter, less energy-intensive and less harmful to the environment. We even helped put a man on the moon. Every day at 3M, one idea always leads to the next, igniting momentum to make progress possible around the world. Supplying innovative and reliable products that help health care professionals improve the quality of care, we are a global leader in medical and oral care products, and drug delivery and health information systems.